Retaining walls and flared stairway. The walls are approximately six feet high and were built using mixed alluvial deposit stone (obtained from a gravel pit). 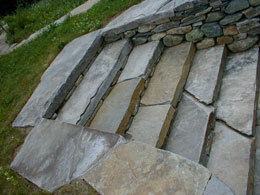 Mica schist from Chester, Vermont was used for the capstones and steps.